On Second Scoop: Ice Cream Reviews: Breyers Waffle Cone OVERLOAD! 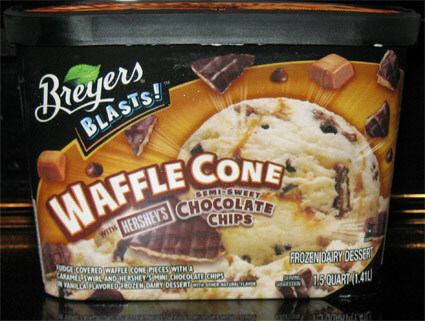 In 2011, Waffle Cone became a Breyers Blasts Flavor. In 2012 they added a strawberry variant. Oh yeah, only in New England can you go from a high of 45 degrees one day and 85 the next! Oh...I just adore those nauseating temperature swings. Am I exaggerating? maybe a smidge, I think technically it was 48 to 83, but no matter, it was painful either way and this weekend had ice cream written all over it. I've had the Waffle Cone in the freezer since the last grocery trip, but it's been on my taste test list for quite some time. 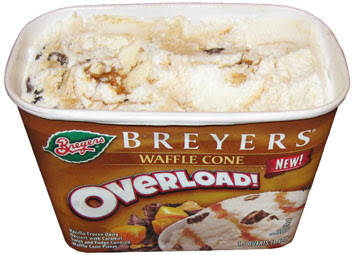 Pretty much everyone has chimed in with a waffle cone flavor so now it's Breyer's turn to step up to the plate...Breyers waits for the right low cal pitch...takes a swing...it looks good...oh, we're gonna get a bounce off the far caramel wall here folks...Breyers is on the move but looks like they'll be held to just a double on this one. So, it's good, but it's not great. It is a low fat dairy dessert, but on a hot day like today, that partially melted vibe hits the spot (well, as long as it's in a bowl and not an ice cream cone). As an added bonus, it doesn't have that chewy Edy's (Dreyer's) thing going on. The cone pieces are good, and there's a decent amount of them....but it doesn't feel like there is enough of them. This isn't to say I didn't enjoy this ice cream today, in fact, I enjoyed it enough to have it twice today. It was hard to resist at 130/25 calories....so why do I only say it's good? It's the caramel. It's not bad, it's just a bit stronger than I want. Not crazy strong, but the Edy's feels much more like a chocolate dessert while this feels like a caramel treat. So while I'd go with Breyers for texture, if I went for taste, I'd have to give the low fat crown to Edy's (could be the chocolate chips making the big difference here). Again, this is a close match, and both are worthy competitors, but Edy's wins this one. Side Note: It's funny that the container still says new even though "technically" it came out July 7th, 2008. On Second Scoop: I'm going to stand by my original opinion. This is called Waffle Cone, not Caramel Cone or Caramel Waffle cone, so why is there so much caramel? It's not that it's awful, and the texture is fine for a low cal snack, it's just not what I want. I'd probably give it a better recommendation if there were more cone pieces. Waffle Cone as a Breyers BLASTS! this flavor is so bomb. i could drink it if it melted. I tried this flavor last night and fell in love with it. It is awesome. Great balance of all ingredients so that none overpower the other. I highly reommend this flavor to all. This is my FAVORITE Breyers flavor! next to Hershey's Chocolate Marhmallow, this is the best ice cream I've ever had in my life.